"Bank of America (abbreviated as BofA) is an American multinational banking and financial services corporation headquartered in Charlotte, North Carolina. The history of Bank of America dates back to October 17, 1904, when Amadeo Giannini founded the Bank of Italy in San Francisco. The Bank of Italy served the needs of many immigrants settling in the United States at that time, a service denied to them by the existing American banks who were typically discriminatory and often denied service to all but the wealthiest. On September 14, 2008, Bank of America announced its intention to purchase Merrill Lynch & Co., Inc. in an all-stock deal worth approximately $50 billion. Merrill Lynch was at the time within days of collapse, and the acquisition effectively saved Merrill from bankruptcy. Around the same time Bank of America was reportedly also in talks to purchase Lehman Brothers, however a lack of government guarantees caused the bank to abandon talks with Lehman. Lehman Brothers filed for bankruptcy the same day Bank of America announced its plans to acquire Merrill Lynch. This acquisition made Bank of America the largest financial services company in the world". 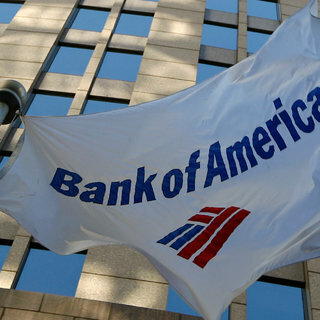 Their flag is a white horizontal flag with the logo (http://en.wikipedia.org/wiki/Bank_of_America#/media/File:Bank_of_America_logo.svg) in the middle and the square American flag symbol below, as seen here: http://graphics8.nytimes.com/images/2014/07/15/business/dealbook/dbpix-bofa-flag/dbpix-bofa-flag-square320.jpg (source: http://dealbook.nytimes.com/2014/07/16/morning-agenda-murdoch-pursues-time-warner/?_r=0). The Kings Dominion 40th Anniversary flag features the celebratory park logo centered on a white field. The celebratory logo is rather complicated. It includes the original park logo from 1975, with the stylized name of the park showing a crown in place of the dot of the lowercase "i" in "Kings." Behind the 1975 logo toward the fly is a pale blue outline of the Eiffel Tower. One of the park's primary attractions since opening in 1975 is a one-third scale replica of the real Eiffel Tower in Paris. Toward the hoist and behind the 1975 logo is the number "40" in gold numerals, with the word "CELEBRATION" in gold letters beneath the 1975 logo. Gold stars and sparkles form an aura around the celebratory logo, which is outlined in pale blue. I said it was complicated.